Advertise and sell on the most basic level. Counter displays are used everywhere. They come in many sizes but are generally smaller sized for displaying on counter tops. 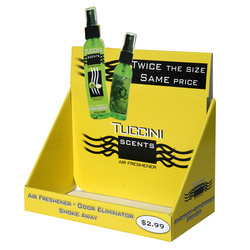 Countertop displays are great for small products because of their limited sizing. Counter displays are not only limited to corrugated material. We can also provide counter displays in paper, plastic, metal and wood. Teamwork Packaging can print, laminate, die cut, assemble, package, co-pack and ship counter displays directly to distribution centers. We will provide initial mockups for all corrugated displays.